I spent most of yesterday cutting out the blocks for my Downton Abbey mystery quilt. Good thing, too, because my kit was missing one fabric! I'm not worried, because I know Michelle will make it good for me. 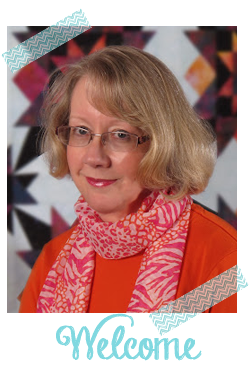 I'm going on retreat next weekend with the "Around the Block" quilters in Cheyenne, Wyoming. The theme is "Downton Abbey," and there will be an English tea Saturday afternoon. I'm taking only my DA mystery quilt, so I should return home with a finished top! But first, today is the birthday of My Little Sailor, and 52 Quilts' co-editor. Happy Birthday, Jacob! It's the "chubby chevrons" row. Pressing the "hatchet" or "chevron" blocks alternately toward the print and toward the background really makes sewing them together easier. Thanks for the tip, Beth! Next are some "swap" goodies. I'm pretty sure the recipient doesn't read this blog, so I'm safe to share them with you! 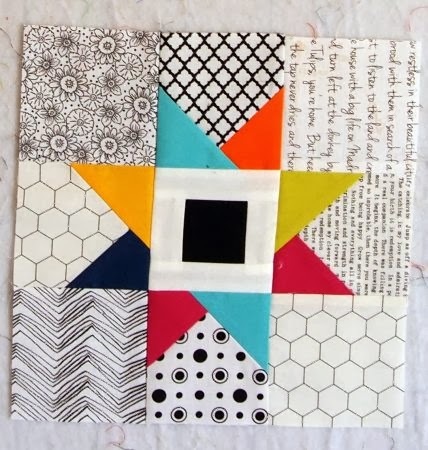 The colors are inspired by Classic Modern Quilts from Kansas City Star Publications. I re-drafted it to make the block finish at 9" rather than 12". And here is another swap block. I showed the Fox and the Houndstooth fabric just yesterday -- see, I DO cut it up and sew it, not just buy it and stash it! I have something really cute to show you tomorrow for Tuesday Tool. But first, I have to paint my nails to match it! Our son's birthday was the 9th. He's not in the Navy but our grandson will be in October! I love your wonky blocks. I particularly like the fabrics. Unwonky is just as cool so, if that floats your boat, go that way! I love the bright wonky blocks. Those are fabulous! I love wonky stars. Just be brave: you can't go wrong; everything goes. They're much easier than flip and sew in my book. 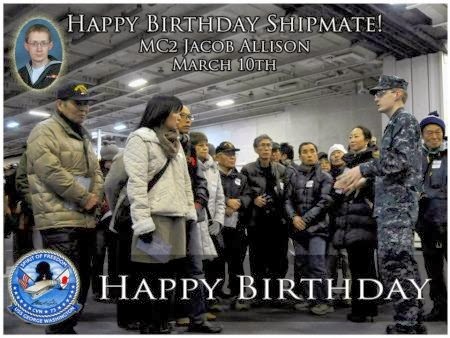 and I'm sorry I forgot: Many Happy Returns of your son's birthday. 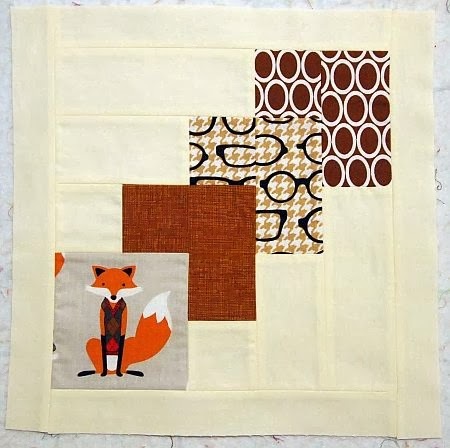 I like your block with the fox fabric. 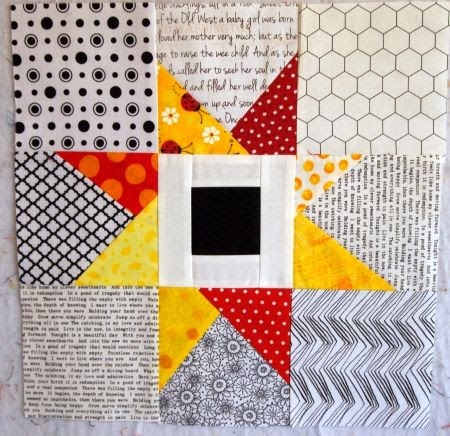 I see many possibilities for other special fabrics and would love to see what else you make with this block. A Downtown Abbey party would be lovely - dressing up for it??? tea, scones & cucumber sandwiches perhaps? Happy Birthday to Jacob :-). Love all those blocks of yours too! Have fun at the retreat...not too much mischief I hope! Lol. The DA tea party sounds grand...enjoy! I hope you will photograph your English tea, I'd like to see if it's what I have for tea here in England. I am in love with that fox fabric, I must look out for it here. It's all pretty exciting! 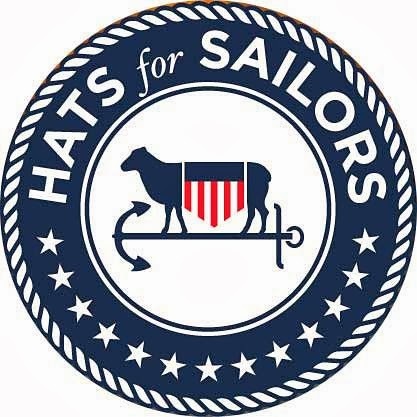 Happy birthday "My little sailor"!!! Hi Marti! 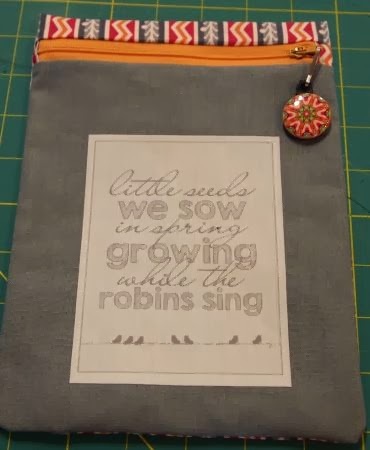 I received your pouch at the swap- thank you! It's really cute and well done.